Ironically, it is the drafters of the Labour party’s NEC Code, not their critics, who have grasped the meaning of ‘working definition’. 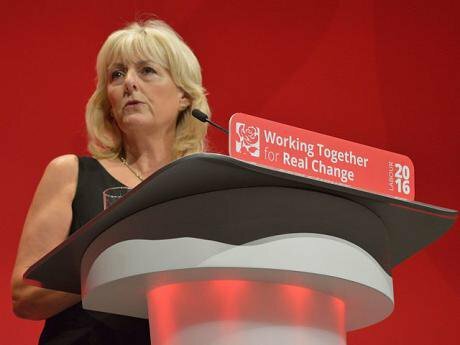 Jennie Formby, Labour NEC member and South East Regional Secretary of Unite the Union, at the 2016 Labour Party Conference in Liverpool.Wikicommons/Rwendland. Some rights reserved. How to deal with antisemitism while at the same time protecting free speech in the political debate over Israel and Palestine? This conundrum lies at the heart of the argument (to use a polite word) in the public square over a new Code of Conduct for Antisemitism proposed by the Equalities Committee, a sub-committee of the National Executive Committee (NEC) of the Labour Party. The proposal is due to be formally endorsed by the NEC on 17 July. I shall refer to it as ‘the NEC Code’. Has Labour tried to “cook up its own” definition? Here is an extract from par. 5 of the NEC Code: “To assist in understanding what constitutes antisemitism, the NEC has endorsed the definition produced by the [IHRA] in 2016”. There follows the definition, reproduced from the IHRA document: “Antisemitism is a certain perception of Jews, which may be expressed as hatred toward Jews. Rhetorical and physical manifestations of antisemitism are directed toward Jewish or non-Jewish individuals and/or their property, toward Jewish community institutions and religious facilities.” In the IHRA document, this form of words, described as a “non-legally binding working definition”, is set off from the rest of the text by appearing in bold and being placed in a box – thus leaving no doubt that this – these two sentences – constitutes the “working definition”. Likewise, in the NEC Code the (identical) definition is set apart by appearing in bold, though indented rather than boxed. No cooking of the books here. The NEC takes the IHRA “working definition”, in its entirety and without altering it one iota, using it as the foundation on which the Code is built: that is “what the hell is going on”. Furthermore, the NEC Code actually strengthens the role the examples play. This point has been overlooked in the public debate, but it makes a significant logical difference. Consider, first, the IHRA document. When the text introduces the list of examples that “may serve as illustrations”, it says: “Manifestations might include the targeting of the state of Israel …” (emphasis added). In a similar vein, we are told: “Contemporary examples of antisemitism in public life, the media, schools, the workplace, and in the religious sphere could, taking into account the overall context, include …” (emphasis added). Thus, the IHRA examples are not intended to be examples of actual antisemitism but only of possible antisemitism. Mere possibility has limited value as a guide to making judgments. In contrast, the NEC Code says (in par. 9) that its examples “are likely to be regarded as antisemitic” (emphasis added). This renders them more serviceable as guidelines. By the same token, the criterion of likelihood raises the bar for determining which examples qualify for inclusion in the list and which call for discussion separately.